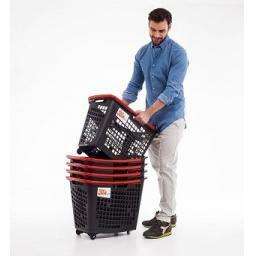 Our new 55L trolley basket is an impressive high quality basket. Unlike others of a similar shape this basket is very stable. The manufacturer has invested in fitting extremely good castors, all silent with 2 being 360 swivel and 2 static. This means the basket can turn easily without falling over. The interior of this pull-along trolley basket is completely flat with no protrusions for the wheels or other fittings. This makes it very practical as a retailers basket as it is very easy to stack goods inside. The extra capacity of 55 litres is also an advantage over others. 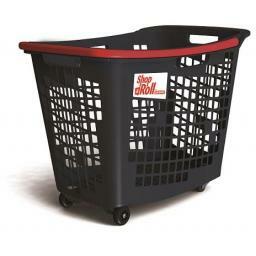 This basket has 4 grab handles round the edge and a single pull long handle making it very ergonomic. This is an impressive basket and one we are very pelased to now be stocking. The 55L Horizontal (TM) trolley basket is a new product that we have brought into stock from the Spanish manufactures Araven.